Kaffeestunde: Thursday, February 1 at 1 p.m.
I’d like to invite all of you to our Kaffeestunde (coffee hour), the German Department’s social gathering of faculty, graduate and undergraduate students. Let’s meet and mingle over coffee, tea and Keksen for an informal chat in German. 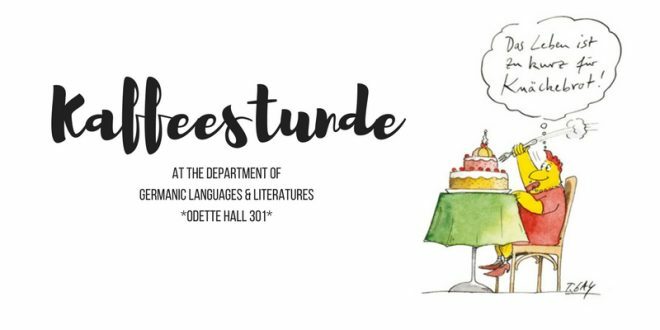 The Kaffeestunde will take place every first Thursday of the month from 1-2 p.m. and every third Friday of the month from 2-3 p.m. in the Lounge of the German Department, Odette Hall 301. Please join us for our next Kaffeestunde on Thursday, February 1 at 1 p.m.
Sign up for our mailing list to receive event announcements and our annual newsletter.